Many American artists did not survive the British Invasion as their hits and careers came to an abrupt halt. Such was not the case for Bobby Vinton, who continued to have hits into the 1970’s and remained a popular club attraction for over half-a-century. “Mr. Lonely” was a song Vinton had recorded a number of years before its release as a single. During 1964, he was putting together his first Greatest Hits album and found himself one song short. “Mr. Lonely” was added and released as a single to promote the album. It proved a wise move as on December 12, 1964, it reached the top of the charts for a one week stay. It was the fourth number one record of his career. There I’ve Said It Again reached the top of the BILLBOARD Hot 100 on January 4, 1964, and remained there for four weeks.It was not known at the time but it would mark the end of an era The Beatles were about to arrive in America. Vinton’s third number one single would officially end the pre-Beatles era in the United States. Vinton was an easy listening crooner who in some ways did not fit in with the music of the British invasion era. Yet he became one of the few American artists to retain his popularity through The Beatles era and beyond. He had nine chart hits before the Beatles and 38 more after they reached America. Vinton’s career is now well past the 50 year mark and he has maintained his popularity through an ever-changing musical landscape. His “There I’ve Said It Again,” in addition to being a huge number one hit, will always separate one era from another. 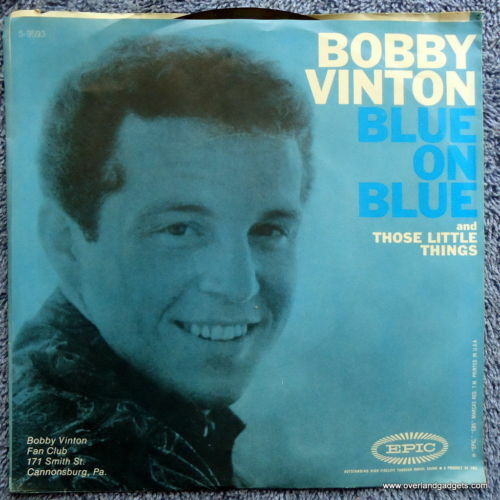 Bobby Vinton had the blues in 1963, which was a good thing. His “Blue On Blue” peaked at number three on the BILLBOARD Hot 100 during the summer. It was decided to release an entire album of songs with blue in the title. Songs such as “Blue Moon,” “Am I Blue,” and “Blue Hawaii” were quickly recorded. “Blue Velvet” was one of the last songs recorded, just to fill out the album. The label decided to release “Blue Velvet” as a single despite Vinton’s objections. This time the label was right. The song entered the Hot 100 on August 10, 1963. On September 21, it became his second number one single. It remained on top of the charts for three weeks and has been played at proms for decades. Bobby Vinton would place 47 singles on the national pop charts with four reaching number one but “Blue Velvet” remains his signature song. Bobby Vinton placed 47 singles on the BILLBOARD Magazine Hot 100, 1962-1980. He was also a rare easy listening/pop singer who had hits in the pre-Beatles era, the British Invasion era, and beyond. It reached the BILLBOARD Hot 100 June 9, 1962 and on July 14th, it reached the top of the charts. It would spend four weeks at number one. The best was yet to come as 46 more singles and three more number one singles would follow. Bobby Vinton produced close to 50 chart hits during the 1960s and 1970s, including four that reached number one. Jusa about all his big hits were ballads with lyrics about love and longing. One of the biggest hits of his career was “Blue Velvet,” which topped the charts for three weeks. It was not his first song with Blue in the title, however. “Blue On Blue” was the single that preceeded “Blue Velvet.” Released during the spring of 1963, it became a big hit in its own right, reaching number three on the BILLBOARD MAGAZINE Pop Singles Chart. Bobby Vinton became a staple in Las Vegas and is still out on the road today. Bobby Vinton signed a contrct with the Epic label during 1960 as a bandleader. For two years years his releases were unsuccessful and so he decided to give it a try as a singer. 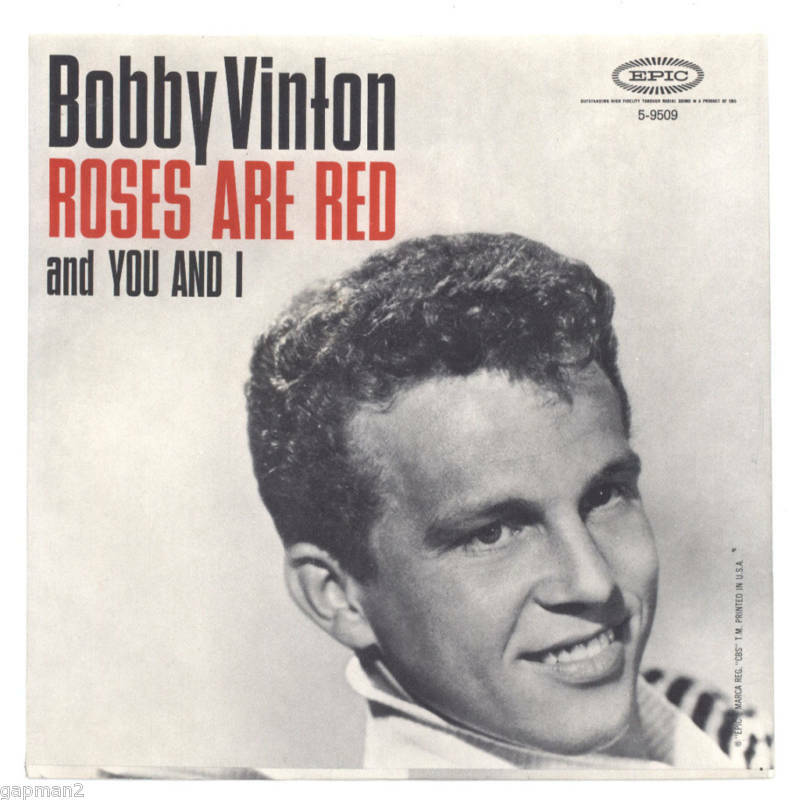 “Roses Are Red” was released June 9, 1962 and on July 14, it reached number one. It spent four weeks at the top of the BILLBOARD MAGAZINE Pop Singles Chart. It was a nice ballad that allowed his voice to soar and set the stage for a long and successful career. It was the first of close to 50 singles that would make the charts during the next 18 years. The album of the same same would reach number five on the album charts. It was also the number one adult contemorary song in the United States but reaching number five on the rhythm & blues charts was a real stretch. 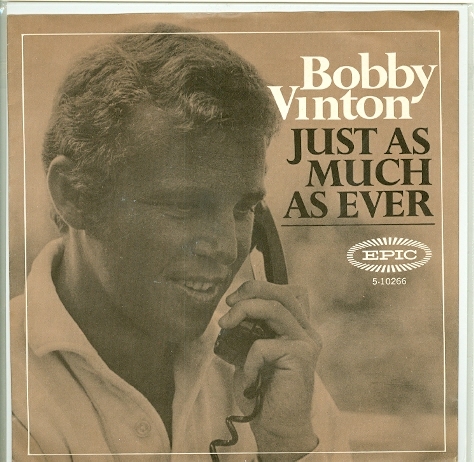 Bobby Vinton was one of few solo American artists who had hit singles before The Beatles era, during the British invasion, and after it all ended. It all added up to 47 chart hits between 1962-1980 including four that reached number one. “Just As Much As Ever” was released December 30, 1967 and reached number 24 on the BILLBOARD MAGAZINE Pop Chart. It was a typical Vinton ballad about love. I would guess that about two thirds of his single releases came with picture sleeves and this one was no exception. Bobby Vinton is now in his mid seventies, he continues to tour and perform in Las Vegas. You are currently browsing the archives for the Bobby Vinton Reviews category.